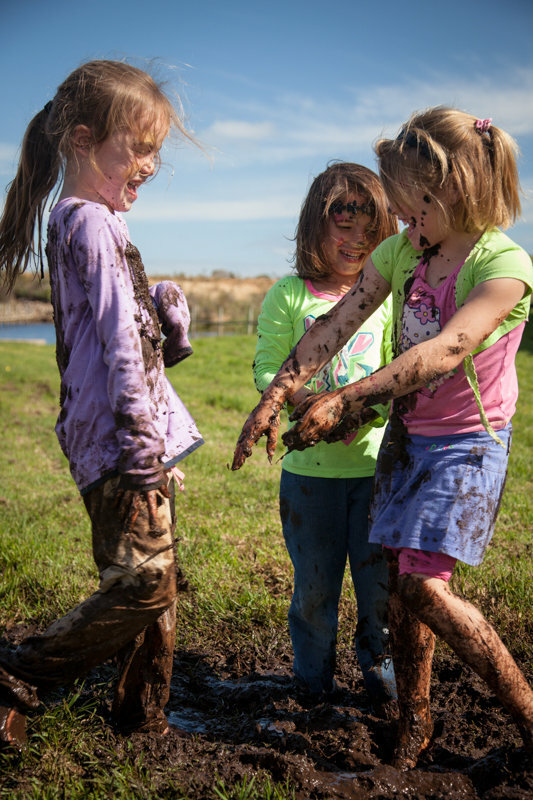 Spring has sprung, flowers are blooming, birds are happily singing and outdoor enthusiasts everywhere are gearing up for a brand new season in the great outdoors. Dust off your mountain bike (MTB), grab you trail running shoes out of the cupboard and load the family into the car. It’s time to make your way to the funkiest festival in the Overberg...it’s time for the Funky Fynbos Festival! MTB and trail running enthusiasts have the chance to take part in MTB and trail running events and stand the chance to win great (and funky!) prizes. The two-day festival is held at two of the most iconic venues in Gansbaai. The first venue is the Lomond Wine Estate where all the sporting events can be found. Wine tasting, craft beer, artisan stalls and the Gansbaai Academia Marimba band can be enjoyed on the vineyard. The second venue is the Gansbaai Harbour, where you will find the Funky Fynbos Market, live music performances, fun activities for the kids and much more. Bring down the whole family for two days of funk filled fun at the Funky Fynbos Festival. 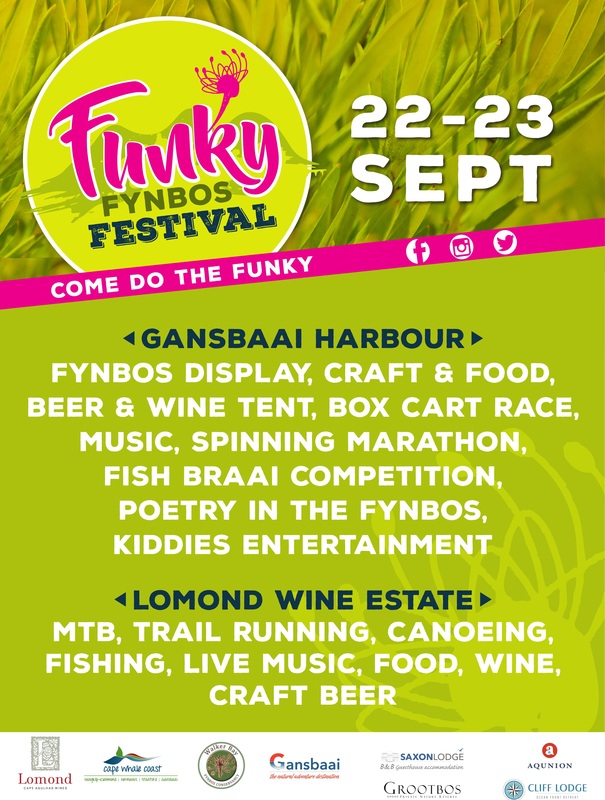 Click on ‘More Info’ below to find out more about Funky Fynbos Festival and how to book. For a full list of the Funky Fynbos Festival 2018 MTB and Trail Running results CLICK HERE. 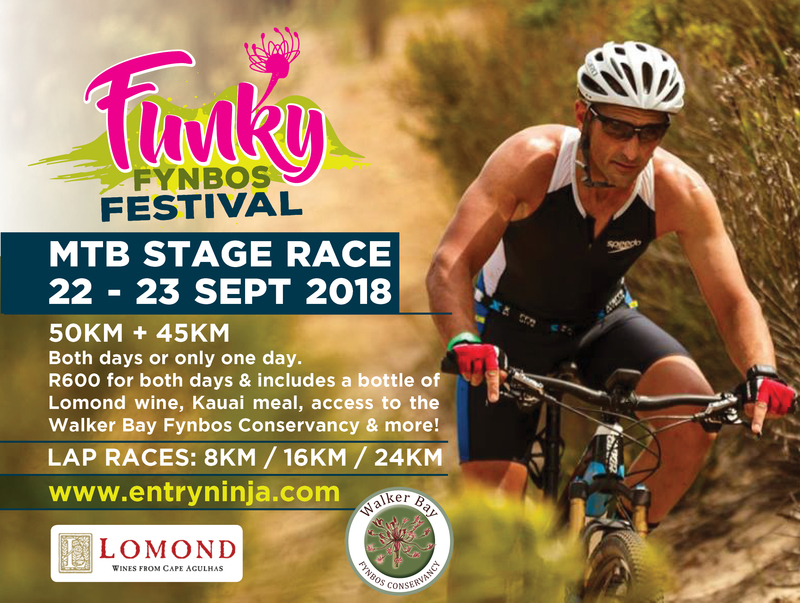 If you’re ready to take on the challenge and compete in the funkiest festival in the Overberg, book now by clicking the links below and get ready for the Funky Fynbos Festival! Funky Fynbos Festival has a lot of funky and exciting activities and events happening. Here is a short itinerary with the MTB and trail running events. Poetry reading & music @ Gansbaai boarding Lodge with wine, coffee and snacks available. Want to enter a Funky Fynbos MTB race? CLICK HERE and let the fun(k) begin! With the help of the Walker Bay Conservancy, the Funky Fynbos MTB races this year are better than ever. Surrounded by the world’s most biodiverse floral kingdom, MTB enthusiasts get to swoop past the opposition while inhaling the lovely scent of the colourful funky fynbos that blankets the Lomond Wine Estate. Compete on a one, two or three lap 12 km race that will challenge you with steep climbs and satisfy you with a gravity aided funky finish. This race is suited for of all skill levels. Not for the faint of heart, this 50 km trail ride will push you to the limit. Absorb the scenery as you climb challenging ascents and watch it wizz by as you make your way down steep descents. This race requires good levels of fitness and technical skills. A funky new kid on the fynbos block! The Funky Challenge is the newest addition to the Funky Fynbos Festival MTB race list. Traverse across some of the most beautiful private farms within the Walker Bay Conservancy as you whittle away the kilometers on this two-day stage race. Test your metal on steep climbs, switchbacks, single tracks, berms and jumps. This race requires an above average level of fitness and technical skills. Post-race cooldown space with great food and award winning wines and local craft beers. 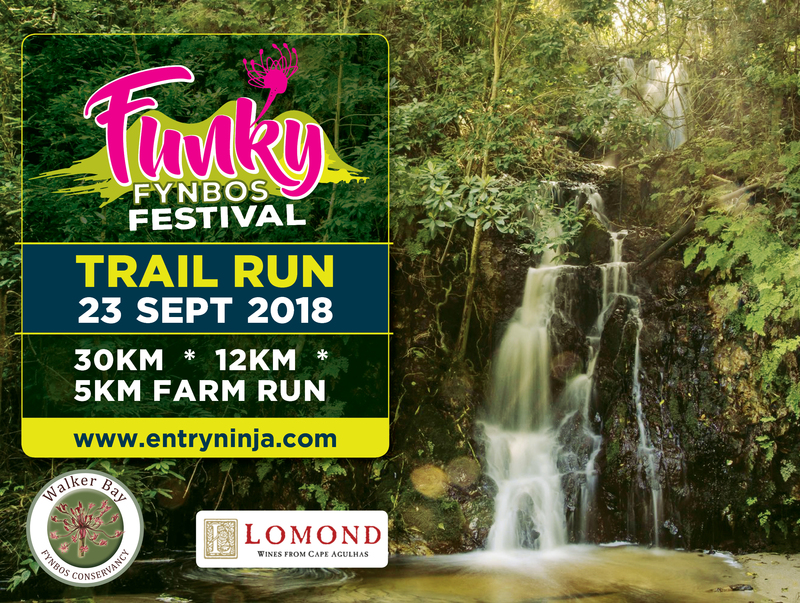 Want to enter a Funky Fynbos Trail Running race? CLICK HERE and let the fun(k) begin! This year’s Funky Fynbos Trail Running races leads the pack compared to previous year’s races. With better trails to run and better scenery to surround you, get that picture perfect photo finish you’ve always wanted as you cross the finish line at the Lomond Wine Estate. The Lomond Park Run is a fun run designed for the whole family. Enjoy the breathtakingly beautiful scenery that surrounds you as you take a leisurely 5 km run around the Lomond Dam. This run is an entry level event aimed at the whole family. The Funky Twelve ‘K’ takes place with awesome views of a mighty stinkwood forest will accompany you along the trail. Use your funky footwork as you make your way through winding farm roads, dusty jeep tracks and popular hiking trails. This race is best suited for trail runners of novice to intermediate skill levels and above. The Fynbos Trail 30km challenge, if you choose to accept it, will take you to a maximum altitude of 1,229m and weaves through fields of funky fynbos and forest paths where you will see magnificent trees that are thousands of years old. The challenge features tough climbs and is best suited for runners with an above average level of skill and fitness. Post-race cooldown area with great food and award winning wines and local craft beers. Want to enter a Funky Fynbos Festival Ironman & Ironwoman Combo? CLICK HERE and let the fun(k) begin! The ultimate test in physical fitness, the Funky Ironman & Ironwoman races will push you to the brink. Take part in a combination of mountain biking on the 22nd and trail running 23rd of September in the medium or long distance races and compete to be 2018’s Funky Fynbos Ironman and Ironwoman to prove who’s the funkiest of the all! The Medium race has a 24 km mountain biking section and a 12 km run that will put you and your gear through its paces. The Long race has a 50 km mountain biking section and a 30 km run meant for the fittest ironmen and ironwomen. This year’s Funky Fynbos Festival has even bigger and better prizes than before. 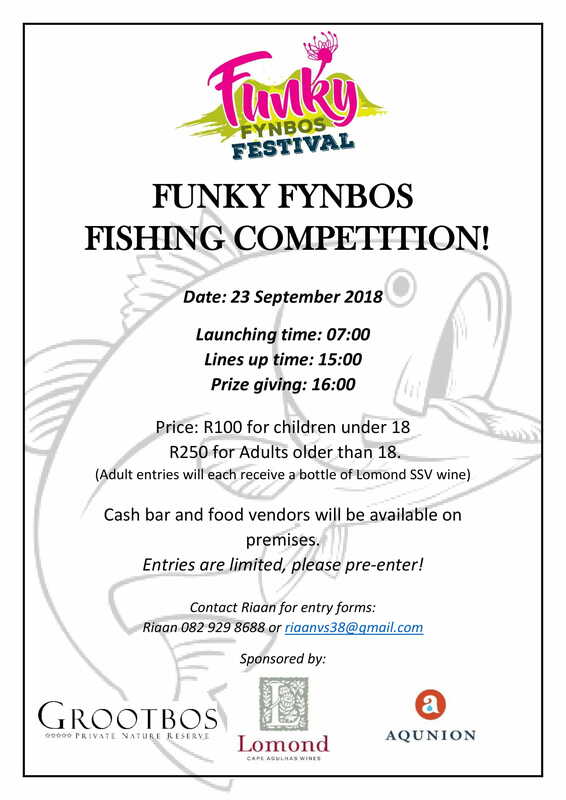 Race participants stand the chance to win cash prizes valued over R6,000 and casual festival goers can take part in numerous lucky draws and competitions to win one of the many amazing Funky Fynbos Festival Funky Prizes. Gansbaai business has stepped up again and provided many exciting vouchers as prizes and lucky draws, be there to win! 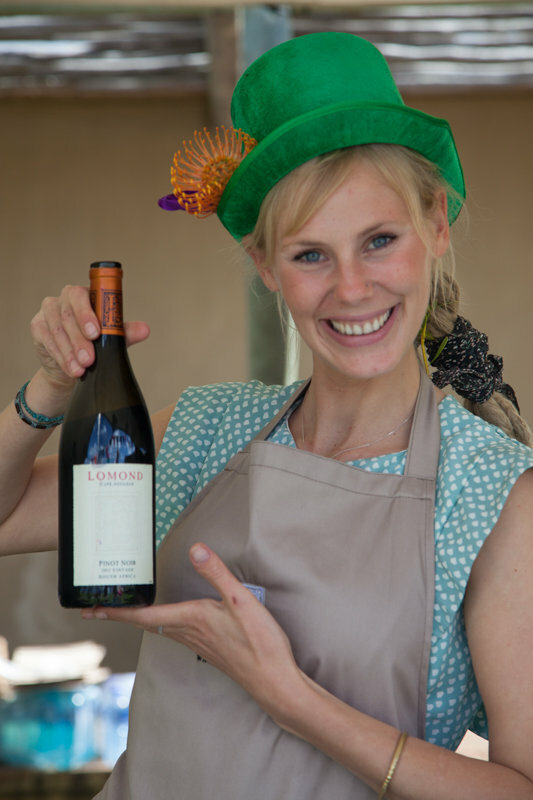 Want to set up a stall at the Lomond Wine Estate? CLICK HERE to register your funky stall today! The first of the funky venues is inland at the Lomond Wine Estate where all the sporting events will be held. Apart from the annual MTB and trail running events, there is a new addition of a two day stage event which has been introduced to the MTB itinerary. Lomond Wine Estate will serve as the scenic backdrop for the tastings of local wines and craft beers supplied by surrounding wine estates and micro-breweries in the area. Moreover, Lomond Wine Estate will host the highly praised Gansbaai Academia Marimba Band to add that extra bit of funk to the festivities. Want to set up a stall at the Gansbaai Harbour Funky Festival? CLICK HERE to register your funky stall today! Set in the Gansbaai Old Harbour, funky festival goers get to enjoy a vibey market atmosphere. Enjoy the sights and sounds of Gansbaai which are sure to keep you entertained from early in the morning until well into the evening. Down at the harbour you will find live music performances, a beautiful fynbos display and handcrafted goods and foods for the whole family. The Cape Floral Kingdom represents less than one percent of the world’s floral kingdoms but is by far the most diverse with 70% of the Cape Fynbos only being found in the in the Cape. 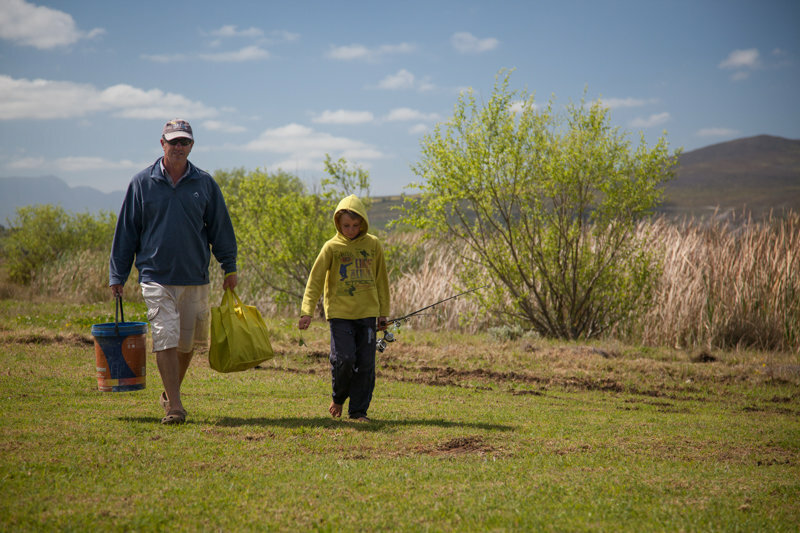 The Walker Bay Conservancy was formulated by a group of local landowners who were concerned at the rate of which their beautiful and diverse lands were being affected by fires, alien vegetation and industrial and residential development. 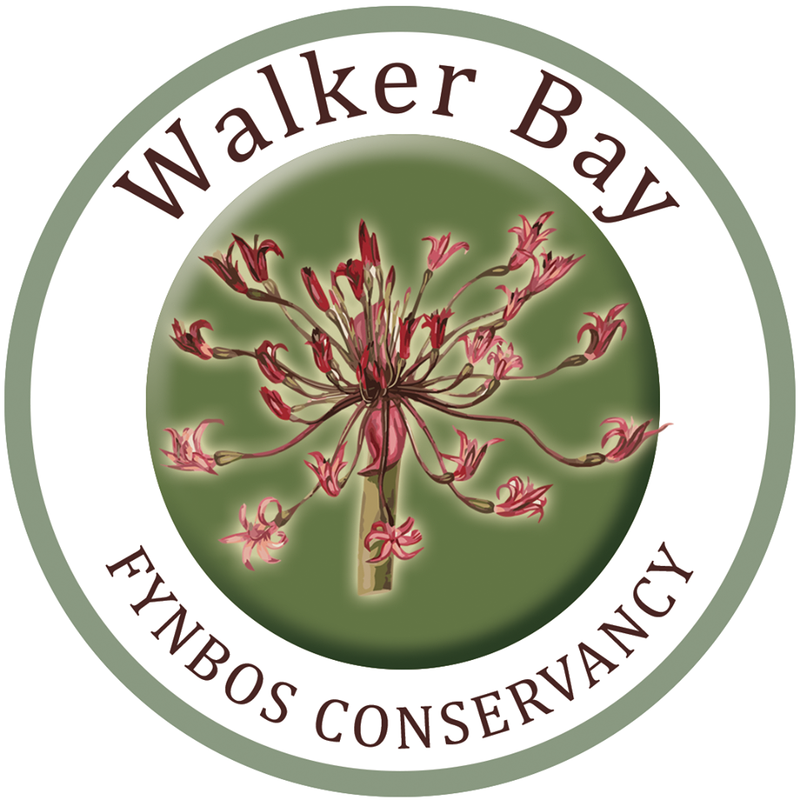 To date there are 26 members that form the Walker Bay Conservancy who together seek to protect and promote the conservation of indigenous plants and wild animals in the area. 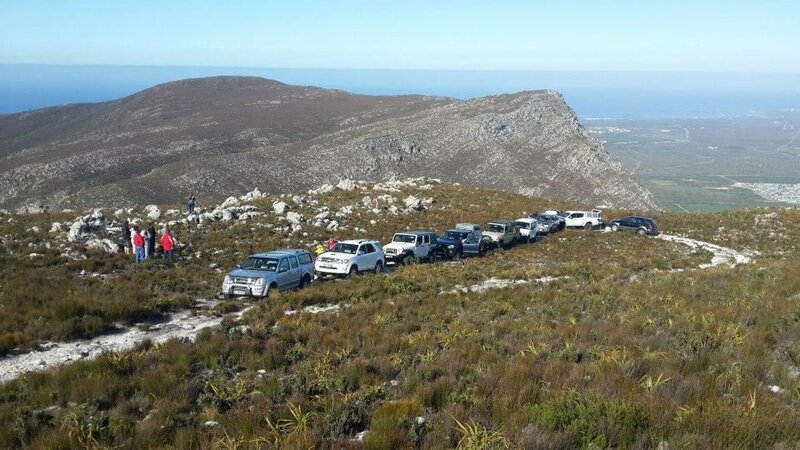 In partnership with the Funky Fynbos Festival, Walker Bay Conservancy has opened up its proverbial doors again and is allowing all the trail running and mountain biking races to take place across their various prestinly well-kept farmlands. In the Gansbaai Harbour you will find a collection of stalls all offering a wide variety of different products. The products range from artisan products, food stalls sponsored by local restaurants and community members and fun activities for the kids. In addition, there will be live music performances to keep you entertained while you weave your way through the Funky Market Fair. Special thanks goes out to all the participating restaurants who are making this year’s Funky Fynbos Festival tastiers (and funkier) than ever. A wholesome restaurant serving traditional and international cuisine all with it’s own unique spin. 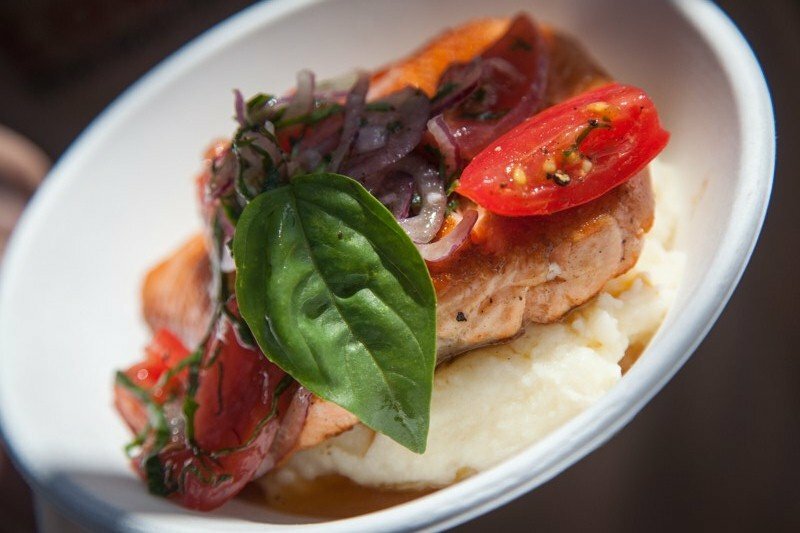 Thyme at Rosemary’s specializes in traditional South African dishes and game. Serving the freshest meals with locally sourced ingredients, enjoy traditional South African and international cuisine with a twist. The Blue Goose specializes in seafood and has a out-of-the-ordinary chef’s menu. Known for its specially crafted italian-style meals, Giuseppe’s is a italian-style Trattoria serving up the best pizzas south of Pisa. Giuseppe’s Trattoria and Cocktail Bar specialize in wholesome breakfast and pizzas. The Funky Fynbos Festival would like to thank the following accommodations in Gansbaai who have directly contributed in no small part in making this this year’s Funky Fynbos Festival even funkier. 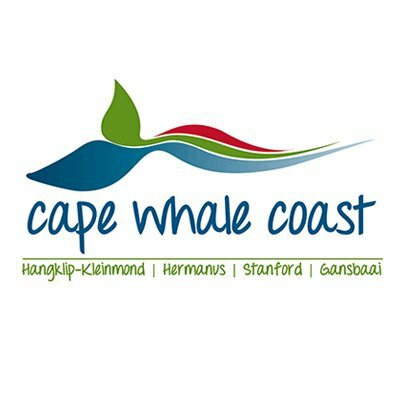 Located in the Gansbaai Harbour, enjoy the sights and sounds of the Walker Bay as you lay your head at this comfortable, down to earth accommodation. A cosy self-catering cottage hugged by nature offering the sweet aroma of the surrounding fynbos with spectacular country living. Bathed in a sea of fynbos, Farm 215 is a nature lovers retreat far removed from the frantic city life offering guests true peace and relaxation. A picturesque family getaway with a modern-mediterranean design located within walking distance of the Walker Bay. A spacious self-catering cottage suitable for the whole family located on the elegant farmlands bordering the Salmonsdam Nature Reserve. The organizers of this year’s festival would like to acknowledge the all the efforts and contributions made by the sponsors and supporters of this year’s Funky Fynbos Festival and the greater Gansbaai community. A heartfelt thank you goes out to all the sponsors, supporters and volunteers of the Funky Fynbos Festival 2018. 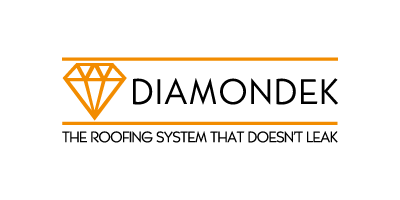 Want to become a Funky Sponsor? The Funky Fynbos Festival gets bigger and better every year! This is all thanks to their wonderful sponsors who continue to support the funkiest festival in the land. If you wish to become one of these sponsors contact Caron Lee directly or CLICK HERE to register. Want to set up your own Funky Fynbos Festival stall? Complete the application form HERE and email it to funkyfynbosfestival@gmail.com. Click here for 2017 Funky Fynbos MTB race results. Click here for 2017 Funky Fynbos Trail Running race results. We are super grateful and proud of the commitment and contribution that our community businesses have made and who have genrously sponsored by way of money, vouchers, venue/ location and effort to this our only fetsival in Gansbaai. The festival's single objective is to attract vositors form ourside of Gansbaai to visit for the weekend and experience this amazing place we call home. Their presence here contributes enormously to our economic growth and brings new energy and love for our town. Many of the prizes are designed for a repeat visit in the future. We continue to look for voucher prizes and sponsorship to ensure a great festival and ask all business to get behind this event so we can turn it into a major calendar event for Gansbaai. We at Health and Active are pleased to announce that we will be hosting a Spinning Relay challenge at the Funky Fynbos this year. The minimum age for entries are 14 years and older and will consists of a 5 hour continuous cycle challenge on a stationary spinning bike. The public or businesses can Rent a bike for R750 rand and may form groups of a maximum of 6 individuals to take part in this relay, you decide how long each person cycles and how many people are in a group, the only two rules are: 1. All bikes must be in use by one of the team members at all time. 2. Maximum of 6 people per group. The Relay Challenge will be hosted at the Gansbaai Harbour and will start promptly at 08h00 and will finish at 13h00. We will be available for late entries from 07h30 onwards and we do encourage people joining in groups to make the most of this challenge and dress to promote your company or just for fun so that we can see you form part of a group. 16 bikes are available 5 of which have a maximum weight limit of 130kg and 11 with a maximum weight limit of 110kg, there will also be bikes available for walk-ins (people not part of groups) and can be rented for R75 per 30 min slots, you can cycle for as long as you like, paying per 30minutes, it all depends how long you are willing to cycle. All group entries will each receive a Health and Active hamper upon completion of the challenge. There will be group instructors, leading the challenge, as well as a live DJ ensuring a great vibe and funky beat to keep you motivated. There will be various supplements for sale, massage treatments for those who cramp up and we will be running a special on this day for people whom would like to become a member at Health and Active Gansbaai. A percentage of our proceedings will be donated to our local animal welfare named BARC. 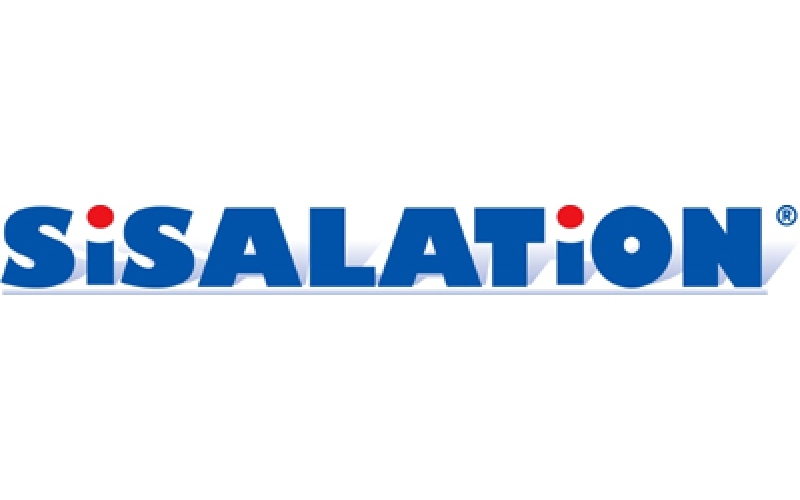 Please note that entries between 14 and 17 years old must have written and signed consent from a parent or guardian (this form can be obtained from us via Email). 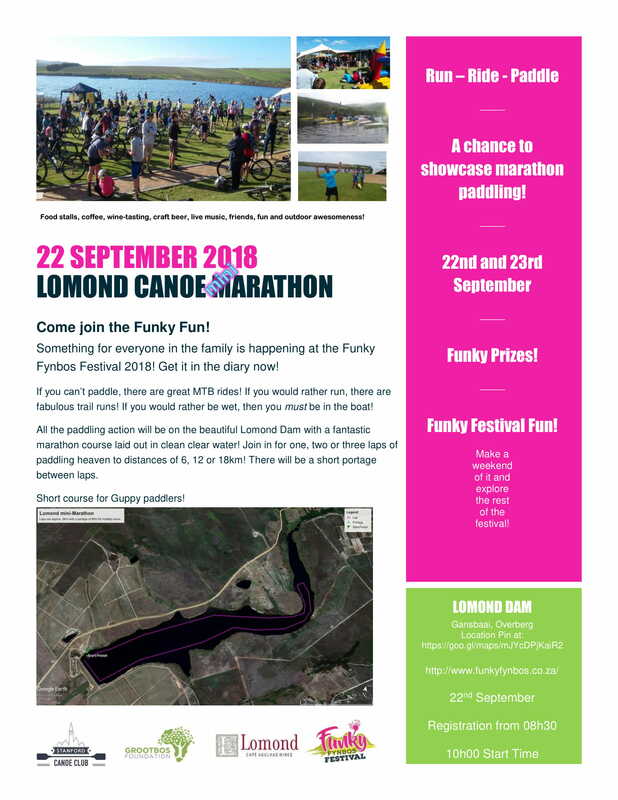 Come join in the Funky fun on Lomond Dam on our marathon course laid out in laps of 6, 12 & 18km. There is a short portage between laps. Choose your distance and paddle in this beautiful environment amongst the vines and pristine fynbos. A short course is available for guppy paddlers. See our blog post for the brochure detail.